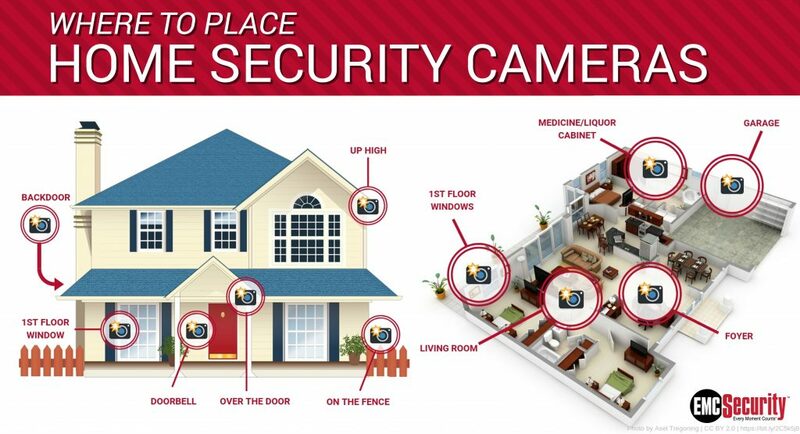 Security cameras seem to be the way of the future for home security, but just buying a camera isn’t enough to keep you, your family, and your home safe. Especially if your back entrance faces the woods, it’s important to keep an eye on what’s going on behind your house. After all, a woody backyard makes the perfect cover for someone trying to break into your home unseen. You can also watch what the kids or pets are up to from a much more comfortable location, like your couch. If your property is gated, and especially if your fence-line is out of sight of the house itself, posting a camera on or near the main and side entrances will ensure that you and EMC Security can see your whole yard, including where intruders are likely to enter. And in the case of an emergency like a fallen tree, wildfire, or other unexpected damage, you’ll be able to spot the danger before it causes serious harm. Windows on the ground floor are one of the most common entrances for burglars, so a visible security camera will go a long way in deterring criminals…and catching them if they do attempt to break in. Wherever you place your cameras outside your house, try to mount them at least 10 feet above ground level. That way, they will be much harder for burglars to tamper with, disable, or cover up. Even if you have outdoor security cameras, having an extra set of eyes in the entrance to your home will let you see who comes in, when, and what they do when they get there. The living room is the heart of the home, and that makes it the perfect place for you to place an indoor camera to watch the comings and goings of your house. Children, spouses, pets, and criminals will all pass through here at some point or another. If you don’t have a door sensor on your garage entrance, it is especially crucial that you keep an eye on the area. Plus, your garage houses what is likely your most expensive possession: your car. Prescription drug theft is extremely common in not just burglaries, but also friend and family theft. In fact, medicine cabinets are overwhelmingly more likely to be raided by someone you know than a stranger. That’s why it’s important to have all drugs, whether over-the-counter or prescription, securely locked away and monitored. The same is true for alcohol. Because basement entrances and windows are often not as well maintained or secured as the rest of the house, basements can be the perfect entry point for a would-be criminal. To learn more about purchasing security cameras for your home, visit this page or talk to an EMC Security Customer Representative at 770-963-0305.